A small silver lining to getting donked all day. Ended up getting caught up in bo's bs had jj raise preflop and flop was 333 but for the dozenth time this game one big pocket pair vs a bigger one. the was finished of by t6 off vs my a5 suited. Bo decides your done your done. A small silver lining to getting donked all day. Am I included in the list of those who "donked" you? 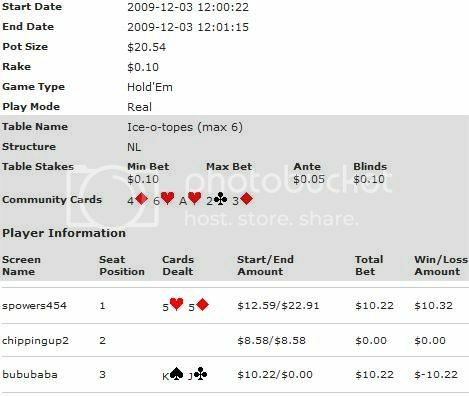 Never really played ring on Bo or done anything else to build my br there just sat on whatever I had and did a few sng's when I was running bad at other sites.. Figured this would be a good jump off of my bo ring. And if the play continues to be this soft I will have plenty more screenshots from there lol. WOW is it bad. Good God Almighty!! What was that person thinking? That was his game. Bully the table and steal every hand. 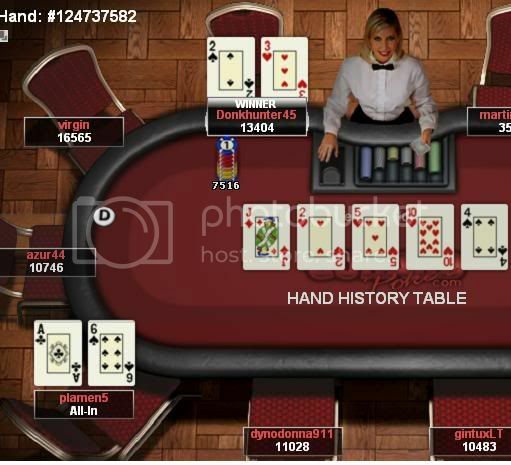 It was only a .10/.05 table and I never bet the hand so he bluffed over $10 with k high lol. Hit some decent hands early but had a lot of insane move on me to chip me up early and after a short card dead spell I took it home. 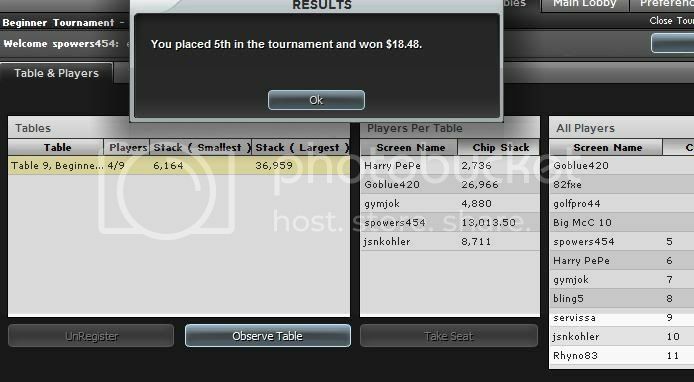 don't play many MTT's anymore so kinda fun taking one down. don't play many MTT's anymore so kinda fun taking one down. Awwww and I thought you were having fun because tb, phil and I were there. You played this well sp. Good job. Great job on your win sp glad to see one of the pfo,er win it.lol i though you just play from our good company. Now you both know I go to chatroom for good company. I play poker to win and call people idiots. Disturbed... Any win on carbon... unles your a complete donk counts for extra lol. great job on your win sp well we had 5 in the game and all 5 made the points. Congrats on the win Sp. Glad that my chips help you to win, that was a key momment went i have you with KK vs your 77 and take me out in 6th, but i think was already written that you will win it, so very well played. Great job, I'm so disturbed that I had to miss it. Glad to see you all did so well. Gratz sp on the win. Ya, we should get double points. Yea that was pretty bad but with my stack I had to put you all-in and hope we were racing. We wasn't but I got lucky. Don't happen to much so I'll take it. Good game logan. This idiot donked me a few times so it is with great pride I get to post the screenshot of me busting this donking moron. 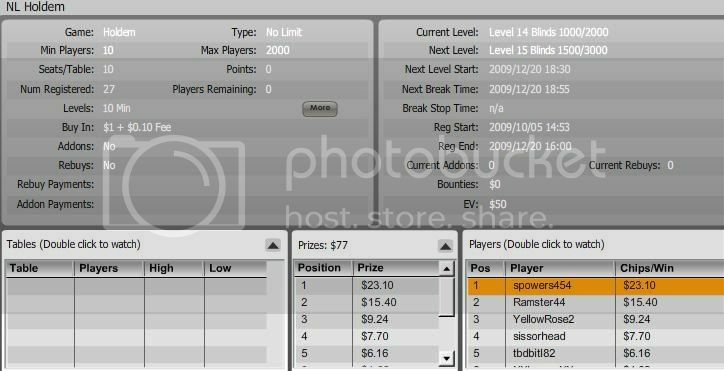 Lmao 1st 23o of the new site, Go hard poker. The hand before This guy doubled me up calling my AK all-in with AJ. 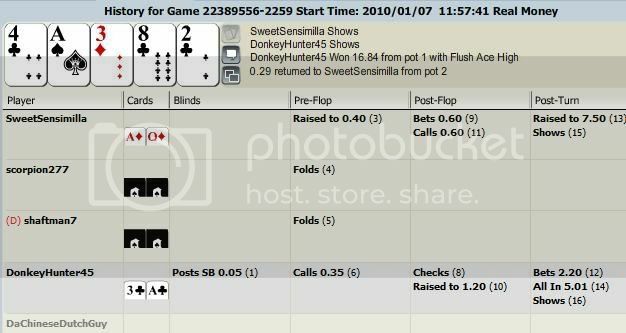 So next hand he goes all-in on my bb and I got to finish him off with 23 off suit. 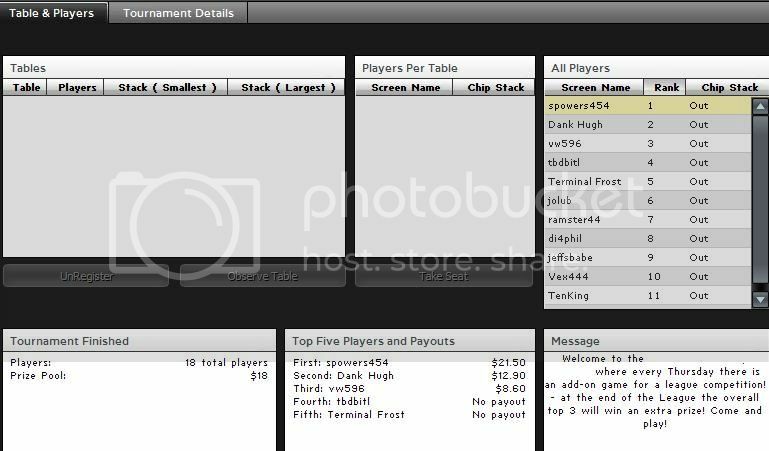 Downloaded aced from the PFO link to get rakeback, only had a little money to deposit so time to start grinding and hopfully posting some decent hands in the bog from here. As for this hand. See what happens kids when you don't respect a check raise. You double someone up holding that top pair like its the nuts. Oh yea nothing can cure the headaches of online poker and at times questionable RNG's faster then a live game. Thought I was going to get to play in the league game at doyles yesterday but got a call from the host "poker tonight at my house you in???" Crap decision time. Play doyles with people I like or play live for presidents I like. Made the right decision but I didn't think so at 1st, A few hands into it and my QQ they made the nut flush killed by aces the made the boat. NOOOOOOOOO. After a rebuy and 45 mins later I finally started rolling when I flopped top 2 with AK suited. Got some money back and more importantly my focus, Calling out hands, making plays on people just based on my read on them when I had nothing. My pride hand of the night was for a $170 pot that the guy played the hand so nuts, including check raising me on the turn and the river. But me being me and zoned in on him knew that he would check the river after check raising me if he was strong he would have bet to make sure he got more from me. He checked I knew he was weak so I bet pot he comes over the top, Utoh did I mess up??? Nope look him in the eyes tell him he's weak and got all-in with King high. Fold lmao, try that rookie crap on someone else. Great night and pocketed some decent cash. Nice!!!! Glad you made the right decision. It's a long season at Doyle's. You can catch up.